In some respects, if you find compliance with the Wellhausen Theory, ((In very simple terms, this theory, held in consensus by many biblical scholars, holds that the Old Testament consists of four different sources that a final editor (redactor) used to produce the text.)) then you will find the deuteronomistic historian’s favor for specific qualities in Israel’s king to be present in our lives as well. He feels that all must worship at the temple in Jerusalem. The temple, however, was not built until the reign of Solomon. 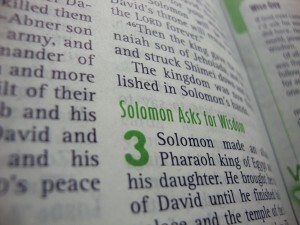 When we read of Solomon in 1 Kings ((1 Kings 3:3)) we note an uncomfortable exception by the redactor. He seems unfair in expecting all kings to worship in the temple when it doesn’t exist, and likewise, in some parallel, I am unfair also. I oppose smoking because it is, to speak of it kindly, unhealthy. ((To my knowledge, it kills you. Correct me if I am wrong.)) Circa 1940 and perhaps earlier (or later), the ill effects of smoking were unheard of. When I see Audrey Hepburn or Humphrey Bogart luxuriously exhale, like the Deuteronimistic historian, I pass an uncomfortable exception. This exception is made in empathy of the circumstance, yet in also holding a desired standard. Final Note: This entry, if for anything, was just an interesting appreciation for the deuteronomistic historian. I’m currently taking a Hebrew Scriptures/Old Testament course for my major, and I’ve developed a new revere for these words. I always thought the New Testament was where the meat of the Bible lay, but as my professor clarified, in order to understand the New Testament, you have to understand where the New Testament authors were coming from and who they were writing to — those familiar with the Old Testament. Endlessly fascinating. My goodness, I love theology.